Here I am, four years old and very happy to be sitting in my yard in Abilene, Texas in front of my favorite childhood flower (the red ones on the left). My mother called them daylilies. It must have been around early May so I always associated this once-blooming flower with the coming of summer. Judging by my haircut, it looks like the above picture was taken in the 1950s but in fact it was 1969, two years after the Summer of Love. My father insisted on the burr but thankfully my brothers and I were allowed to grow our hair out by the time we went to school. I know now that these daylilies are in fact a relatively rare hardy amaryllis or St. Joseph lilies (Hippeastrum x johnsonii). I loved these bright red amaryllis especially for their spicy scent. Since we are more familiar with the scentless indoor hybrids, many people are surprised that these heirloom southern bulbs have such a strong wonderful fragrance. I later dug up a few and grew a pot full for several years in my New York apartment before they finally petered out. These zone 7-10 plants are available from Plants Delights Nursery here. 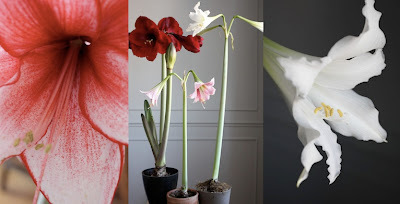 Thought to be the first hybrid amaryllis ever produced, it was the result of a cross, perhaps unintentional between Hippeastrum reginae and Hippeastrum vittata performed between 1799 and 1810 by Arthur Johnson, a watch maker from Prescot in Lancashire County, England. Mr. Arthur fortunately shared his plants with the Liverpool Botanic Garden prior to his greenhouse, and its contents, being accidentally destroyed. Hippeastrum x johnsonii made its way into cultivation in the United States by the mid 1800's and was in Santa Barbara when Dr. Francesco Franceschi performed his 1895 survey of plants being grown in Santa Barbara. While this plant is rarely offered in nurseries it can be found in older gardens and cemeteries, particularly in southern California, the southeast and in Texas. 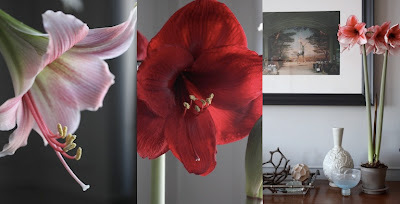 These are the more ordinary amaryllis that are blooming in my apartment right now. From left: 'Misty', 'Red Pearl', and 'Charisma'. All these indoor hybrid amaryllis (more correctly Hippeastrum) are from Van Engelen. Note: the 'Charisma' is three feet tall in its tiny pot. What could be better to get you through the winter than this? 'Charisma' looks like someone blew red tempera powder on white flowers. 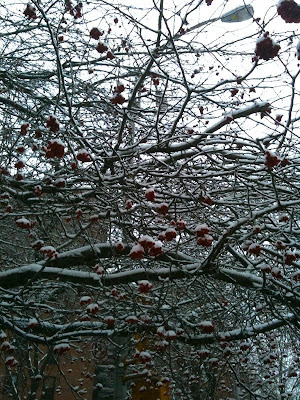 Chad took this photograph just down the far corner of our street of a large Northern mountain ash or rowan (Sorbus decora) covered in red berries and snow. I like this native tree very much and often pick my route to and from the apartment to walk by it. Its white spring flowers have a strange, funky scent. Then in fall and winter, it's covered with little dangling clusters of reddish-orange berries. The fruit—a big crop this year—seems to persist for most of the winter even though I've read that the birds love them. The European species of rowan (Sorbus aucuparia) is said to ward off witches because it is the tree on which the Devil hung his mother. How sad, I hadn't realized he had done that. The wood is also traditionally used to make druid staffs. As I write this I remember that I also had an American rowan at the corner of my block when we lived in west Chelsea in the 1990s. Hmmm. What can it all mean? I also remember once doing a story on a very attractive, very fancy lady in Scotland for House & Garden. The photographer and I saw a beautiful rowan tree covered in berries near her castle and we asked if she would stand under it for a portrait for the shoot. She emphatically refused saying, "Absolutely not! My stepchildren already think I'm a witch so there's no way I'm going to be pictured standing under a rowan!" Don't you just love Europeans? Seems to me that this would have been valuable pictorial proof that indeed she was not a witch otherwise she couldn't have gone near it. Delight of the eye, Quickbane, Quickbeam, Quicken, Quickenbeam, Ran tree, Roan tree, Roden-quicken, Roden-quicken-royan, Round wood, Round tree, Royne tree, Rune tree, Sorb apple, Thor's helper, Whispering tree, Whitty, Wicken-tree, Wiggin, Wiggy, Wiky, Witch wood, Witchbane, Witchen, Witchen and finally Wittern tree. We've been having a lot of snow in NYC this winter. It's always beautiful, that is if it doesn't hang around on the ground for more than a day or two. Folklore says that a heavy crop of rowan berries is supposed to forecast a hard winter by the way... Well I guess I'll just put on another Kate Bush cd and get back to writing. 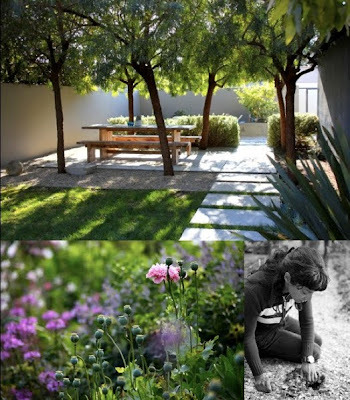 Please join me as I show a photographic preview of my upcoming garden book on February 24th at the New York School of Interior Design. 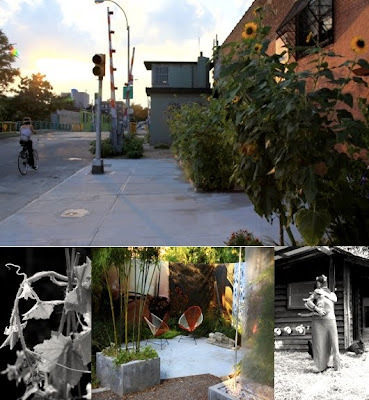 I am honored to be on the same Wave Hill lecture series with Patrick Cullina of the High Line and Dominique Browning my former editor at House & Garden. I hope to see you there! If you are a blog reader and I haven't met you before, please come introduce yourself. I will be attending all three lectures. Buy tickets here online from the Wave Hill website. Explore the High Line from a horticultural perspective, its sources of inspiration and its role as one of New York City’s newest, unique urban landscapes. 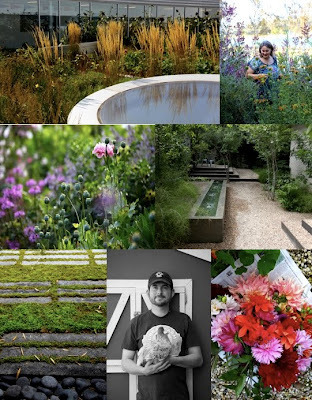 Patrick Cullina is Vice President of Horticulture and Operations for Friends of the High Line. The economic downturn, coming in the wake of the green movement, is causing some intriguing shifts towards a more responsible, less complicated way of thinking about our yards. Stephen Orr focuses on a new approach to gardening, championed by a number of designers and homeowners, that marries traditional environmental concerns with a flexibility and a sensitivity to aesthetics previously missing from green-gardening orthodoxies of the past.” His first garden book, Tomorrow's Garden, will be published by Rodale Press in fall 2010. Her third book, Slow Love, will be published in the spring of 2010 by Atlas & Company. Ms. Browning will share musings and readings about "selling her old house, and making a new garden in Rhode Island—and what it is like to uproot, transplant, and repot oneself."